Connecting The Dots With The Respect Principle’s mission is to transform respect from a discretionary value to a global principle to raise the standard of living and quality of life of all people, aided by original intellectual capital of the concept presented in a diverse range of books, products, and services, plus special events and projects. Ramping up the for-profit social business venture to its next level, the search is on for a seasoned, well-balanced, highly respectful leader in public relations, fundraising, and sales. Reflecting your excellent communication and relationship-building skills, you thrive on the thrilling challenge of generating your salary based on 100% commission sales. Your compassion, plus your passion for learning and sharing also reflects your enthusiasm that serves as a positive change catalyst. You have the potential and desire to be one of the three potential vice presidents and limited partners. Our other two teammates will be an administrative specialist and operations specialist, all of whom will work closely with the originator, researcher, developer, artistic director, founder, and president, though not necessarily from the same geographical location. After a probation period, limited partner equity will be acquired through salary deduction rather than an upfront cash contribution. 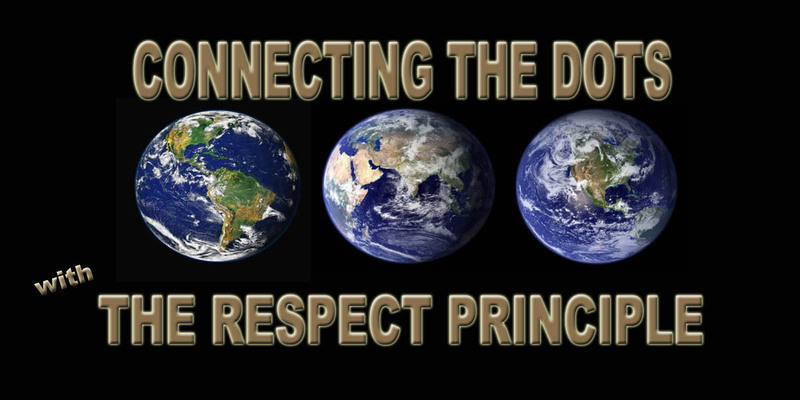 Submit a 50 word statement explaining why you want the role and why you would be the best Connecting The Dots With The Respect Principle Social BUSINESS DEVELOPMENT Specialist through LinkedIn messaging. When we realize, evidenced by the state of the world, there is a dominant negative influence shaping our thoughts, words, and actions, we are then empowered to transform ourselves and the state of the world with a powerful positive influence born of conscious choice.